The forecast weather conditions had sounded promising but the utterly different conditions that materialised - clear skies, bright sunshine and the lightest of breezes - defied expectations by dropping plenty of migrants. Willow Warblers made up the bulk of the numbers, with a good 300 at the Bill where 60 Chiffchaffs and 40 each of Wheatear and Blackcap accounted for the only other double figure totals; among the wide variety of also-rans 10 Redstarts, 4 Grasshopper Warbler, 5 Pied Flycatchers, 2 Yellow Wagtails, a Lapwing, a Common Sandpiper, a Yellowhammer and a Corn Bunting were dotted about the centre and south of the island. Sea passage never really got going but 44 Pale-bellied Brent Geese over Ferrybridge and 70 Common Scoter, 3 Red-throated Divers, 3 Eider and a Great Skua through off the Bill were of note. Two each of Dark Sword Grass and Silver Y made up the overnight immigrant tally in the Obs moth-traps. The Obs has prided itself on managing the Crown Estate Field and Helen’s Fields for a number of years now to benefit migrating birds and this has been a great success. However there has always been a thought that we could get paid to do this land management through a government funded Agri-environment (AE) grant scheme. In 2016 the observatory started to look at this more seriously to consider which AE scheme would best fit its needs and the type of land management that would most benefit migrating birds and farm wildlife associated with Portland Bill. This was very much a team effort and I worked with Martin, Pete Morgan (Chair of the Obs Trustees), Richard Newton (Obs trustee and the Observatory’s Farming expert) and Alex Butler from the Farm Wildlife Advisory Group (FWAG) South West to explore how we might best achieve this. Through the summer of 2016 we put together an application that we saw as the best fit and submitted this at the end of September 2016. We are now proud and excited to announce that Portland Bill Bird Observatory has been accepted into the Countryside Stewardship (CS) scheme with the CS agreement starting this year and running for the next five years. Countryside Stewardship (CS) is an Agri-environment government grant scheme run by Natural England on behalf of Defra which provides financial incentives for land managers to look after their natural environment through activities such as conserving and restoring wildlife habitats. The CS scheme land management options have been specifically designed to benefit England’s wildlife habitats and the species associated with these habitats. Monitoring evidence is now showing that farmland biodiversity will respond positively if the right agri-environment options are put in the right places and at the right scale. Which land management options did we choose and why? We tailored the Observatory CS agreement to put in place a package of measures to benefit the farmland birds, wild pollinators and other wildlife associated with the farmed environment at Portland Bill. In particular we focused on the land management that provides the year-round life cycle needs (year-round food, shelter and nesting places) that these species need in order to thrive. It also includes land management options that will benefit the migrating birds that pass through Portland Bill each spring and autumn. This option will provide important food resources for farmland birds and migrating bird species, especially in autumn and winter. Pipits, thrushes, chats, warblers, finches and buntings will all benefit, with many migrants using the mixes as a valuable refueling stop in the spring and autumn. The idea of sowing these mixes is to provide an abundant and available supply of small seeds during the autumn and winter months. Farmland and migrating bird species will utilise the seeds from the autumn onwards and insects including bumblebees, solitary bees, butterflies and hoverflies will also use the flowers in the mix during the summer. The mixes are sown between early March and mid-June to establish a seed mix of cereals, brassicas and other plants which produce small edible seeds to meet the autumn, winter and spring food needs of the birds. The mixes once established last between one and two years and then are re-sown. There is flexibility with the seed mixes we can use too, so we can have more cereal based mixes or more Brassica based mixes depending on the species of birds we want to attract in. The blocks of mixes can be rotated around the Crown Field and Helen’s field through the lifetime of the CS agreement. This option provides important food resources for farmland birds in late winter and early spring on arable farmland, by supplementing crops of winter bird food when they have been depleted and before natural food sources become available in the late spring. Species that will benefit will include species like linnet and reed bunting and may in time attract in other rarer species such as yellowhammer and corn bunting. The period between January and early spring is often referred to as the ‘Hungry Gap’ for farmland birds when food can be in very short supply and so providing this additional food source during this time period will be extremely beneficial to these farmland bird species. Tailings (the small seeds and chaff removed from the harvested crop) are used as the supplementary feed and this is spread on the ground, at least once a week from early December until the end of April. This option is used to create an open-structured cereal crop (using wheat, barley, triticale, oats or rye) which is not too dense, which then provides summer foraging sites for localised farmland birds and habitat for rare arable plants. This will be important for wild pollinator species such as bumblebees, solitary bees, butterflies and hoverflies. The resulting open nature of the crop will provide suitable habitat for nesting birds such as skylarks, and a range of declining arable plants and other broadleaved species will also benefit. The more weedy nature of the resulting stubble from the crop will also be beneficial, providing food for farmland birds and other migrating birds through the autumn months. This option is also rotational and can be moved around the Observatory’s land holdings each year. The Bill area holds significant breeding populations of skylarks and most of this specially managed crop will be sown in Helen Field’s to help benefit these important populations. We included this option as we wanted to provide some areas of flowering plants to boost essential food sources to benefit pollinating insects and other invertebrate species found at the Bill. The idea is to create an abundant supply of pollen and nectar-rich flowers between early and late summer for pollinating insects such as bumblebees, solitary bees, butterflies and hoverflies and other invertebrate species. The option works by establishing a mix of nectar-rich plants using species such as early and late flowering red clovers, sainfoin, birdsfoot trefoil, knapweed and musk mallow. The mix is established in blocks or strips between mid-March and late April or mid-July and late August. This option then remains in place for the duration of the agreement to provide a continuous long-term food source for pollinators. As well as benefiting insects and invertebrates this habitat will also provide an important foraging habitat for breeding and migrating birds. There have been historical records of rare arable plants such as Shepherd’s Needle at the Bill. We added this option into the agreement to create uncropped, cultivated areas which would benefit a wide range of these scarce and declining arable plants, and also provide areas of less densely vegetated ground for insects and other invertebrates. The management is simply to create fallow margins or plots annually by cultivating in the spring between February and April or in the autumn between September and November and leaving these areas in place each year. This option can be rotated and placed where we think it will benefit arable plants the most. This then provides the bare ground habitats to help vulnerable species of arable plants such as Shepherd’s Needle to germinate and complete their life cycle. It also helps foraging insects such as bumblebees, solitary bees and hoverflies visiting flowers and the bare ground created and provides more open foraging habitat for farmland and migrating birds. We have also added in some additional capital works into the agreement including planting new hedges in and around the Crown Estate Field. Using native hedgerow species associated with the Isle of Portland we will plant lengths of hedgerow in and around the field to create good foraging, nesting and sheltering habitats for birds and other wildlife. The Observatory will monitor the success of the agreement. 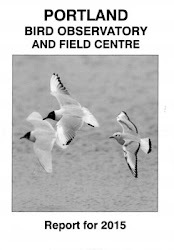 Through the daily migrant census and the annual breeding bird survey of the PBO recording area (which has been carried out each year since the mid 1960s) we will be able to track the biological responses of the bird species and other wildlife we are targeting to the land management we are putting in place. Who knows - the land management may well fit the needs of the next autumn Pine Bunting at the Bill or even attract in the first ever Pallas’s Reed Bunting at the Bill, we can but dream…..! Finally, I'd like to record a huge debt of thanks to Richard Newton who undertakes all the farming work on behalf of the Obs; these activities take place in Richard's own time and we've benefitted enormously from his long experience and local knowledge. If you would like to know about the PBO CS agreement then please do drop me a line.